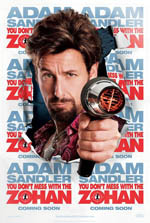 What did you think of You Don't Mess With The Zohan? This was quite possibly the most ridiculous, pathetic, lame excuse for a comedy I’ve ever seen. From the piss-poor acting, to the absolute moronic script, everything about Zohna is completely, and utterly stupid. I could go on and on for days about everything that was wrong with this movie, I just don’t want to waste any more of my time on it. I’ll sum up, and keep this as short and as on-point as possible; the accents, the script, the dialogue, the acting, the fight scenes, the story, the ending, the beginning, the middle. Everything about this movie is completely wrong. It’s not funny, at all, ever. Adam Sandler couldn’t make a funny movie these days if it was handed to him pre-made, and he just had to put his name on it. The Adam Sandler we used to love 10 years ago is dead. This new imposter has taken over, and ruined the reputation that Adam Sandler once had. I don’t care if you love Adam Sandler with every ounce of your being, save yourself the pain of watching this movie. It’s absolute garbage. I wish I could give it a negative rating, but our site doesn’t allow for that. I wish pain upon the people who wrote and made this movie. Serious, serious pain.